Donnie Andrews (r), with Michael K. Williams, the actor who portrayed Omar Little, the character based on Donnie, on the HBO series The Wire.A few months ago, I posted about the death of DeAndre McCullough, a bit-player on The Wire who in real life played a starring role in David Simon and Ed Burns’ The Corner, a year-long chronicle of life amidst Baltimore’s drug trade. McCullough was the hapless son of Fran Boyd, a tough-as-nails drug addict whose eventual rehabilitation is one of the few bright spots among Simon and Burns’ chronicles. Now Donnie Andrews, the convicted murderer whose supportive phone calls from prison Fran credited as helping her get clean, and the man she would eventually marry, has died at age 58. 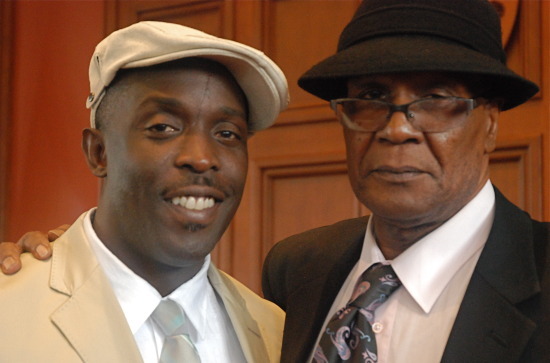 But Andrews is best-known as the inspiration for The Wire character Omar Little, the stick-up man who preyed on drug dealers in keeping with his own unique moral code. Wow, what a life. Hang in there, Fran Boyd. Here’s a clip from The Wire where Andrews plays a jail-house enforcer enlisted by Butchie to serve as Omar’s protector. Andrews appears around 00:50.